Phaidra (Permanent Hosting, Archiving and Indexing of Digital Resources and Assets) is the University of Padova Library System’s platform for long-term archiving of digital collections. Phaidra hosts various types of digital object (antiquarian books, manuscripts, photographs, wallcharts, maps, learning objects, films, archive material and museum objects). Phaidra offers a search facility to identify specific objects, and each object can be viewed, downloaded, used and reused to the extent permitted by law and by its associated licences. The objects in the digital collections on the Phaidra platform are sourced from libraries (in large part due to the digitisation projects promoted by the Library System itself), museums and archives at the University of Padova and other institutions, including the Ca’ Foscari University and the Università Iuav in Venice. Anybody can carry out searches and browse the digital collections archived on the platform, and unless otherwise indicated, anyone can view and download the digital objects themselves. Every object uploaded to the Phaidra platform has a permanent link and persistent identifier (on theHandle.net registry), which can be used for citations. Objects and digital collections archived on Phaidra are available to a huge user base, meaning they can be used more extensively and more effectively. Objects of various formats from multiple sources can be organised in virtual collections and relational links can be set up between different objects. Each object can also be assigned separate licences for specific uses, and access to an object can be limited to consulting the relative metadata and viewing a thumbnail preview. It can easily be configured to comply with Data Management Plans. With comprehensive mapping of object metadata to the Dublin Core profile, it offers excellent interoperability with other platforms, such as Europeana. It uses an internationally recognised classification system. The project first sees the light of day at the University of Vienna in 2008 (http://datamanagement.univie.ac.at/en/). In a meeting of 23 February 2010, the Technical and Scientific Committee of the University of Padova Library System commits to an agreement with the University of Vienna for the former’s use of the Phaidra system and its contribution to the platform’s development (see minutes of meeting no. 2/2010). Between 2012 and 2013, as part of an exchange agreement under the European-wide Linked Heritage project a number of Phaidra collections are published on the Europeana platform. In 2014, the Ca’ Foscari University and Università IUAV in Venice begin publishing digital collections on the Padua-based system. In 2016, the University of Padova Library System becomes part of the COAR Federation, an international network of bodies responsible for managing open-access digital repositories of academic literature on behalf of institutions. Phaidra is used by a number of institutions internationally. Information about these partners is available at phaidra.org. Phaidra timeline at the University of Padova. Phaidra staff is composed of librarians and IT staff of the Digital Library Unit and allows maintenance and development of Phaidra. Moreover, it supports the Central Libraries and the Library Clusters in the drafting of digitisation projects and provides assistance and advice in the creation and archiving of digital collections to the University of Padova Units and to other cooperating institutions outside the University. Phaidra Annual meeting, composed of all Phaidra partners, aims to discuss the future development of Phaidra. All Phaidra partners are invited to present their projects and their proposals for the system improvement. The meetings take place in a location that can vary from time to time. Phaidra Annual meeting has replaced Phaidra Steering Committee since 2018. Technical meetings, involving library and IT professionals, aimed at introducing and progressing operational and developmental issues in relation to the platform. Erasmus Staff Mobility for Training: the exchange program is used in a systematic way for on-the-job training of the personnel of the two universities. The partnership between the University of Padua and the Ca’ Foscari and IUAV universities in Venice comprises the sharing of the Phaidra platform through the publication of the digital collections of the Venetian universities in the Padua installation. 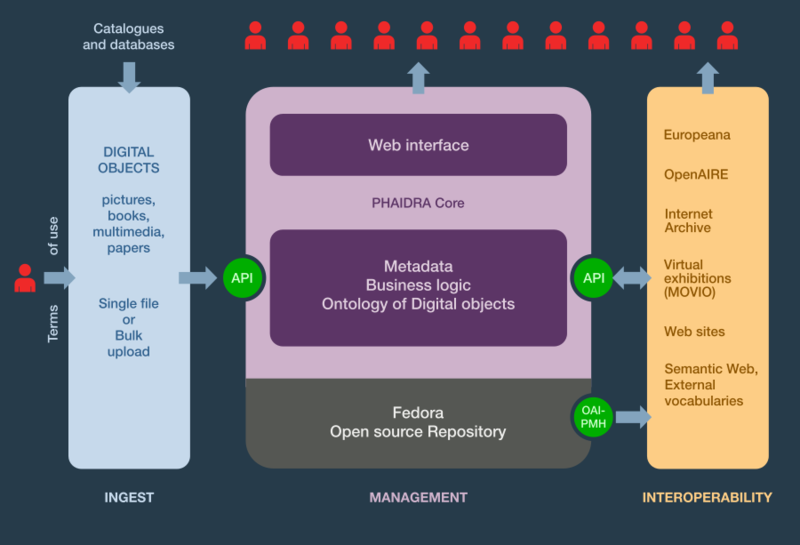 Phaidra is based on the open-source Fedora operating system, a modular architecture for managing digital resources that enables the creation of digital archives and libraries for the purposes of access and conservation. It is also used to allow specialist access to large digital collections of historical and cultural material, as well as scientific data. The Phaidra digital environment (Source: I dati della ricerca in ambito umanistico, symposium held in Padua, 24 November 2016). Based on Fedora, Tomcat, Apache and MySQL open-source software. Web interface: various applications written in Perl using the MVC Catalyst framework. Fedora offers LDAP authentication and XAMCL authorisations for granular management of permissions. Based on Perl and Java APIs, with the option of carrying out full-text searches and searching metadata using Lucene technologies including the Solr platform. Interface is fully localised in English, German and Italian. Uses UTF-8. Access rights can be managed at user, group and institution level. Limit to content access can be set indefinitely, or for a set period of time. The following relationship types can be set up between objects: same category, belong to same collection, recto-verso, alternative versions. Phaidra adopts a modified LOM schema (Learning Object Metadata), with the option of using alternative metadata schemas (MODS – Metadata Object Description Schema, ICCD standards for museums…). Dublin Core metadata are generated from LOM or MODS schemas, with the possibility of other mapping systems integration. Moreover, Phaidra adopts various classification systems (Dewey Decimal Classification, PACS, EuroVoc, ACM), offering the option for the adoption of other systems.